A variation on one of Wheel’s favorite dessert, Seven Layer Magic Bars, and Bytes favorite dessert, Pumpkin Pie. 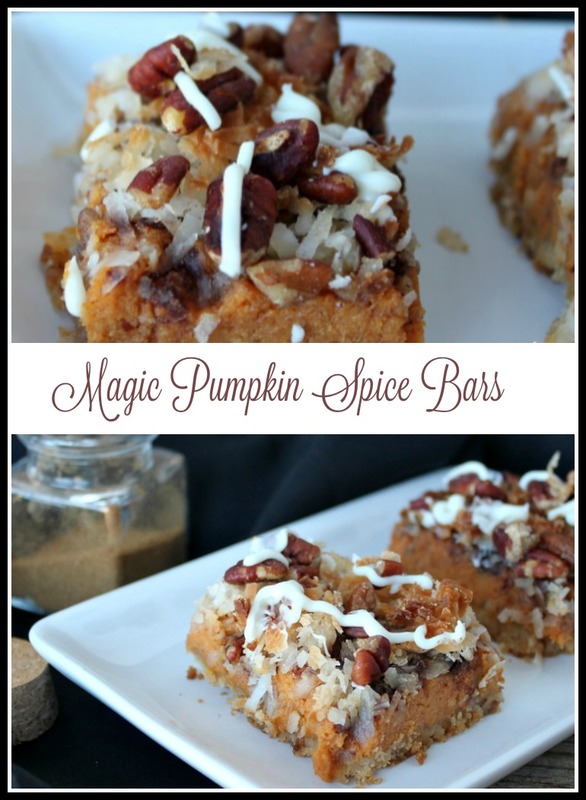 Magic Pumpkin Spice Bars are a delicious compromise! 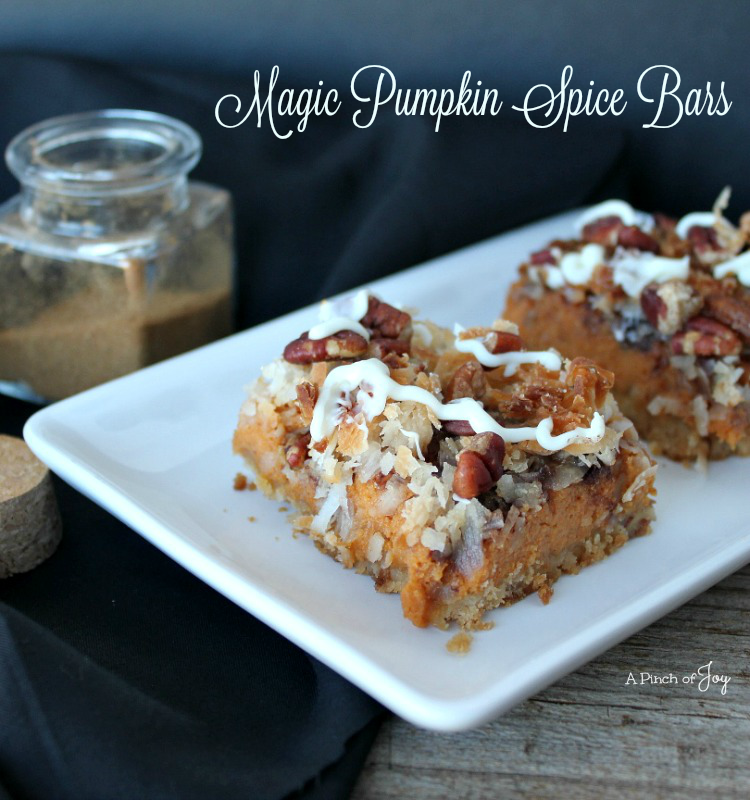 The pumpkin filling is just right spicy on a base of crushed vanilla wafers and topped with coconut, pecans, crushed toffee and white chocolate. You can crush the vanilla wafers in the food processor. Or put them in a zipper bag and crush them with the rolling pin. Or pull the bag out of the box, cut off one corner to allow air to escape and beat the cookies into crumbs with whatever weighty object is at hand — a heavy glass or a jar of peanut butter, say. Which method do you think I used?? Yep, peanut butter works well. By the time the butter was melted in the microwave — about 45 seconds — crumbs were forming nicely. A heavy glass also works well to press the butter and crumb mixture into the baking pan. The spice combination is well balanced — not so spicy as to take over the dessert, but enough for a delightful flavor. The cardamom is optional, but if you have it on hand it makes a nice contribution to the overall flavor. Cardamom is somewhat pricey in the grocery, but you might find lower prices if there is an ethnic grocery store in your area. The toffee bits you will find with the chocolate chips. I melted the white chocolate chips to drizzle over the finished dessert in the picture. Just sprinkling the chips over the pumpkin bars immediately after you take them from the oven is better. Less time and more chocolate — win-win! Spiced pumpkin filling on a crushed vanilla wafer crust, topped with chewy coconut, crisp pecans and white chocolate. Yum! 14 ounce can sweetened condensed milk. Place wafers in food processor; pulse until coarse crumbs are formed. OR crush wafers in zipper plastic bag using a rolling pin. Melt butter in microwave, about 45 seconds, until liquid. Add melted butter to wafer crumbs and stir until blended. Press into bottom of greased 9x13 inch baking pan. In large bowl, mix cream cheese, sweetened condensed milk, pumpkin, and spices. Beat with mixer until smooth. Pour evenly over wafer crust. Sprinkle toffee baking bits evenly over filling. Layer coconut, followed by pecans. Bake 45-50 minutes or until golden brown. Remove from oven and immediately sprinkle white chocolate chips over top. Cool in pan placed over wire rack about 10 minutes, then run a knife around the sides of the pan. Cool completely. Cut into bars.